Long known as one of the nation’s top energy capitals, Tulsa is also making a name for itself by attracting new business in aerospace, biotech and information technology. That and its low cost of living make the city in northeast Oklahoma the second best place in the country to start a business, according to Time Magazine. With nearly 1,000 energy-related companies calling the region home, three of them are in the Fortune 500: OneOK, NGL Energy Partners, and Williams. Some of the taxes generated by these businesses are funding the city’s downtown revitalization, an effort capped by the new BOK Center, a 19,199-seat indoor sports and event venue. An arts center and numerous restaurants, stores and hotels are also in the works for downtown Tulsa. 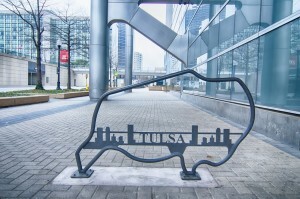 One of Tulsa’s greatest assets is its affordability. The cost of living in this city of about half a million people is roughly 11 percent below the U.S. average. Cheap housing is one of the reasons why, with homes values and rentals at 30 to 35 percent below average. Affordability and Tulsa’s reputation for having a highly skilled and eager workforce would explain Macy’s $170 million investment in a direct-to-customer fulfillment center there. Some companies, particularly those in information technology industry, are drawn to the area for its sophisticated telecom and data transmission infrastructure. And they generate high-paying salaries. Tulsa is also getting the thumbs up from biotechnology businesses ranging from agriculture to bio energy and medical devices. Plus it’s attracting suppliers, producers and customers in the aerospace sector, including BizJet, a business aviation solutions company, and American Airlines Maintenance & Engineering Center, one of the largest commercial repair and overhaul facilities in the world. Finding high tech talent is one of the biggest challenges companies face. But Tulsa’s well prepared work force is one of the key reasons WalletHub rates Tulsa as the second best city for startups. Tulsa’s high number of industrial graduates convinced the Site Selection Group, an independent location and economic advisory firm, to rank Tulsa at the top of the list of cities that are attracting new businesses. Entrepreneurs looking for mentors and investors in Tulsa can find help with i2E, a private not-for-profit corporation focused on helping companies, inventors, researchers launch and grow new businesses and gain access to needed capital. No matter where your company is located, you can make it seem more approachable by selecting a local phone number. With Halloo you can route calls to your employees anywhere. Get your local San Jose phone number today! Caren is a retired newspaper reporter turned freelance writer who enjoys yoga and caring for her two fat cats. This entry was posted in Local phone numbers, Small Business by Heather. Bookmark the permalink.